Weighty Matters: Did the OMA Go Too Far With its Childhood Obesity Recommendations? Did the OMA Go Too Far With its Childhood Obesity Recommendations? The uproar has been furious. Literally. And I certainly understand why. But it's not because the Ontario Medial Association (OMA) went too far, it's because the OMA lost control of the message. 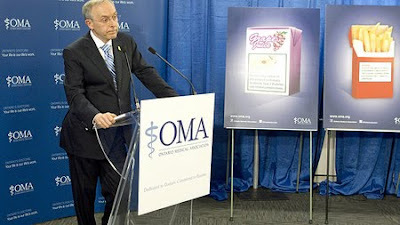 For readers who aren't aware, on Tuesday the OMA held a press conference where they outlined multiple initiatives that they hope if enacted, will help in preventing further increases in Canada's rates of childhood overweight and obesity, and perhaps even help to lower them. The OMA's calls to action stemmed from what they described as "Lessons learned from anti-tobacco campaigns" where indeed the use of graphic imagery, taxation, retail display changes and advertising bans did have a tremendous collective impact on smoking rates. The challenge would be in implementing these sorts of interventions without vilifying people with obesity - and it would indeed be a challenge, but not one that I think would be insurmountable. Moreover I think dealing with that challenge might serve society well in terms of truly exploring the stigma and bias faced by those with weight. So could the OMA have simply left out "obesity" from this initiative altogether? After all, the consumption of the products targeted by this campaign are no less unhealthy for skinny folks than for fat ones. Could the OMA have simply focused on the fact that as a society and perhaps especially with our children, over the past 50 years or so, we've completely normalized the regular consumption of junk food, of highly processed boxed meals instead of cooking, of frequent meals out, of no-name fast food in school cafeterias, of chocolate-milk school milk programs, of pizza days, and at the same time created a Food Guide that specifically states juice is a fruit? I think that in an ideal world the campaign could have targeted those normalizations all by themselves, but in our real world, I don't think it would have garnered much attention or cultivated much discussion. Putting the actual recommendations aside, what the OMA is really saying here is that we need to get off our collective asses and actually do something - because talking isn't getting us anywhere. How and what we do is certainly up for debate, but losing sight of the need to start doing, of the need to formatively change the incredibly unhealthy landscape in which we raise our children, and instead exclusively focusing on whether or not the graphic imagery is a good plan, is missing the forest for the trees. And that's definitely where the OMA struggled some. The media, and indeed even some of my colleagues, have latched onto this notion that the OMA is suggesting that obesity is the new tobacco. Ultimately I don't think that's the message they're promoting, but admittedly it was their backdrop and call to action. Actually reading through their materials, and speaking with the folks involved, I think their real message is that junk food, not obesity, is the new tobacco. That just like with tobacco we need to denormalize junk food's provision, marketing and consumption and that were we to start exploring recommendations like those they put forth, we'd be starting down that very important road of doing rather than simply sitting around and casually talking about it while our children suffer.